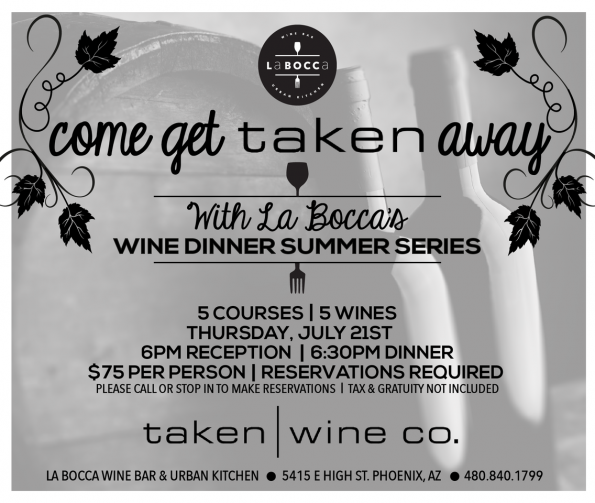 Both La Bocca Urban Wine Bar + Kitchens, located on Mill Avenue in Tempe and High Street in Northeast Phoenix, respectively is proud to partner with Taken Wine Company from the St. Helena region of Napa to host their first-ever winemaker dinners on July 20 and 21, respectively. Each evening will begin with a 30-minute reception including passed hors d’oeuvres, followed by a five-course dinner specially created for the event by La Bocca’s award-winning chef, Judd Cummings. These events are the first in a planned series of wine dinners La Bocca will host through the end of the year. La Bocca Tempe’s dinner will take place Wednesday, July 20. La Bocca North’s dinner will take place Thursday, July 21. Winemaker Notes: The 2014 harvest was cool and wet. Rain and weather conditions resulted in an early harvest. Partnering with meticulous farmers resulted in perfectly ripe fruit with slightly lower alcohol than average. This wine has great balance and a softness which makes it easy drinking and enjoyable. Cheese course featuring gorgonzola with red pepper; purple haze goat cheese; cacao di roma semi soft sheep’s milk cheese and red dragon mustard cheese, accompanied by a selection of almonds, cranberries, candied walnuts, herbs and artisan bread. Winemaker Notes: Opulent flavors of peach and guava dominate this classic Sonoma Chardonnay. Hints of Meyer lemon and apricot flavors, coupled with well-integrated French oak make for a well-rounded Chardonnay with great balance. Winemaker Notes: Intense aromas of ripe red cherries and strawberries, licorice, and clove. Blueberry and other subtle black fruit aromas emerge as one swirls the wine. Roasted lamb shanks over slender carrots, baby turnips, fingerling potatoes, parsnips, red and yellow beets in a red wine glaze, finished with rosemary and sage. Winemaker Notes: Intense aromas of ripe blackberries and blueberries, crushed graphite and earthy notes, underlying deep tones of dark chocolate and espresso with hints of vanilla and toasty French oak. Winemaker Notes: Crushed raspberries and ripe red cherry burst out of the glass from this perfectly balanced Sonoma Coast Pinot Noir. A full midpalate of red berries and plum lead to a lingering finish of fruit and acid with lightly toasted oak and subtle earthy notes. There is a distinctive silky and caramelized taste and texture to this wine. The Taken Winemaker Dinner, limited to 40 guests, is priced at $75 per person, plus tax and gratuity. For reservations, please call (480) 840-1799. Taken Wine Company was founded in 2010 and is the vision of two friends who both grew up in Napa and come from a long line of winemakers. The brand is sold and marketed by Trinchero Family Estates, Napa Valley vintners since 1948. The portfolio includes more than 30 brands such as Sutter Home, Trinchero Napa Valley, Napa Cellars, Terra d’Oro, Seaglass, Trinity Oaks, Folie à Deux and Ménage à Trois, among others. For more information, visit www.takenwine.com. A Valley staple for nearly a decade in Tempe, with a second location on High Street and a highly anticipated third location coming soon to Chandler, La Bocca Urban Kitchen + Wine Bar brings together everyone’s all-time favorite Mediterranean and Italian ingredients. The food is locally sourced and made fresh to order with only the finest ingredients. Offerings range from fresh basil and creamy hummus to savory prosciutto and fig bruschetta and made-from-scratch pizzas. Guests will also find an assortment of scrumptious sandwiches, fresh, zesty salads, hearty entrées and decadent deserts. In addition to the food, La Bocca boasts custom handcrafted cocktails and more than 100 wines from across the globe. 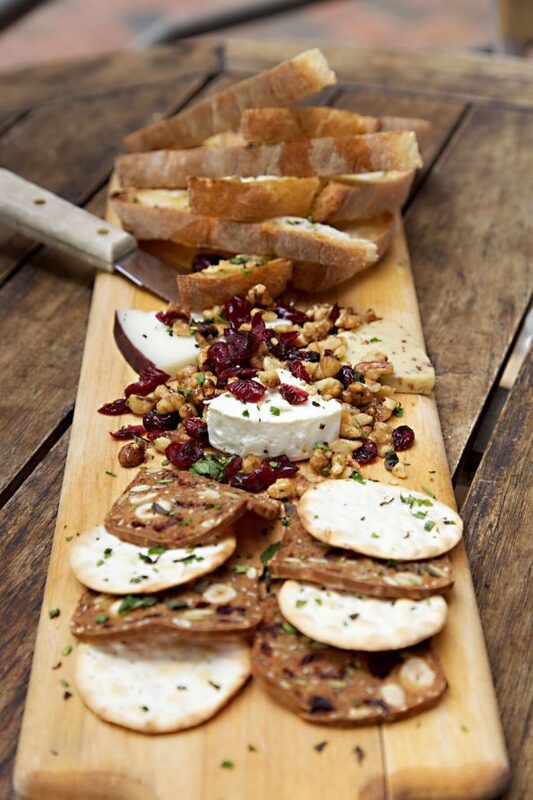 Each of the locations in the Valley offers daily wine-board specials, custom wine flights, house-made red and white sangria, house-made seasonal cellos, and happy hour daily from 3 p.m. to 6:30 p.m. For more information, visit www.laboccapizzeria.com.